We left Innsbruck for Zurich at the early hour of 7:45. After scarfing down a quick breakfast at the hotel, we booked it to the train station to catch our ride to Switzerland. Actually, we technically crossed another country off the list as we travelled - we rode right through Lichtenstein. If you're looking at Europe on a map, you might need to zoom way in to even tell that Lichtenstein is there but it is and so were we! We are still debating whether or not it truly counts since we didn't step foot on Liechtensteinian soil. We arrived to Zurich a little before noon. 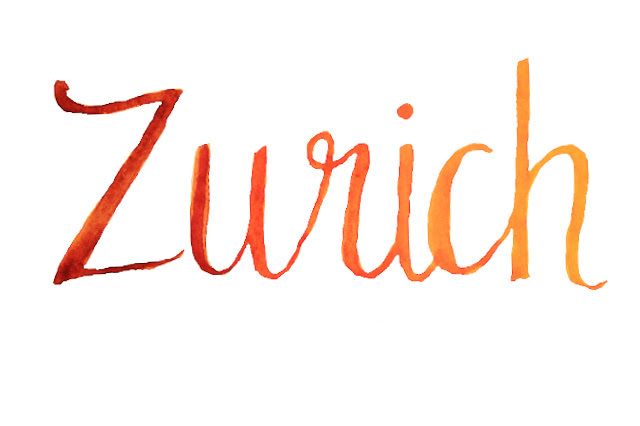 Our first impression of Zurich was that it was EXPENSIVE. The Swiss Franc at the time we went was equal to the same value as the dollar, and yet things were priced so unbelievably high. Could you imagine paying 18-20 dollars for a burger with no sides? Well, you might find that to be an affordable meal in Switzerland. We'd been warned that prices were high and had planned for only one night in the city, but we were still not prepared. After setting our bags in our hotel, we were off to explore what would be our maaaaaybe least favorite city of the trip? I hate to brand it that way, because it really is beautiful, but honestly the prices of things sort of killed our opinion of it. And if every trip has to have a dud place and Switzerland is the worst we could do, I guess we had a pretty decent trip. A name Carson's mom still defends considering for him while in utero is Babalu. Thankfully, I am not married to Babalu Bay, but we did find a sign with that name for him to pose under. Our experience in Switzerland is pretty much clouded by one bad experience and that is this: the fondue place. Fondue in Switzerland is a thing, and it is an expensive thing, but we thought that we should probably try it because we were there. None of us were too hungry, and none of us were hungry enough to justify a nearly 30 dollars-a-pot thing of cheese per person, so we'd decided to split two things of fondue - one for Carson and I and one for Danita and Fern. Our waitress said that it wouldn't be enough for two people to share, but since it was so expensive and since we didn't feel that we could stomach THAT MUCH bread and cheese, we insisted on two bowls for four people. There was a little back and forth on this, and then the waitress claimed to understand and returned shortly with the cheese. We were surprised by how large our two fondue pots looked and wondered how anyone could imagine eating one of these all by themselves, as we struggled to finish off ours... and I think you can figure out where this is going. The bill came once our bowls were clean as a whistle, and lo and behold, we'd been charged for four portions and not two. Despite our clarifications and the waitress saying she understood, she did what she thought was most reasonable and brought four portions. Now we had to pay for four portions. Usually, I think we'd treat this as a cultural experience and say "Oh well, should have communicated better" but since we'd communicated pretty clearly "Two fondue for four people - one for us to share, one for them to share" we felt really duped and tricked. Since we'd eaten it, it wasn't as if we could return a bowl and claim to have a portion of it returned, and the waitress kept explaining that she didn't think that two portions was enough for four and that was that. We've discovered that the customer is always right is not a thing in Europe, and here it was downright bad. And the worst part was that we had to pay nearly 150 (we'd ordered drinks) for bread and cheese. The Melting Pot, with five courses and drinks included and all kinds of dippers, is less than 100. It felt like robbery. It stunk. And honestly, we were angry. It felt very clear that we'd been tricked (our waitress talked to us in English and spoke it perfectly), and it was our least favorite restaurant experience ever. So. Should you decide to try fondue in Switzerland I have some tips. Number one is - don't go to "Swiss Chuchi". Number two is to have one person order and have the other person wait outside until there is no chance that the waiter or waitress believes that the second person is going to eat. And then share. Number three would be to go to McDonalds because even if the Happy Meals are 25 dollars (I bet they aren't, I'm being facetious), it's still a better bargain and you get fries and a drink. Here are some pictures of us before we got the bill that made us cry. And in case you're wondering, we decided to skip dinner that night and would have tried to skip meals the next day too if that were an option. After that delightful adventure, we were all a little bitter about the experience, so we walked around and spent no money. Zurich really is pretty. I thought this frozen fountain was just lovely. Swiss watches and Swiss Army Knives were everywhere, and many of them came with hefty price tags - remember that the prices you're seeing are equal to dollars. We saw these watches and said "That's a CAR!" We did visit the famous Sprungli Chocolate shop, where I ordered two little macarons. And then we meandered over to Lake Zurich, where we watched the birds and enjoyed the view. Next we visited the Opera House. I wish it had occurred to me to look up shows in the various Opera houses and theaters in places we visited, but honestly we probably would have looked a bit too casual for that anyway. Spot my mom's name, spelled correctly? I looked at postcards and Swiss army knives while Danita and Carson climbed these stairs and Danita made friends with a nice cat. Lastly, we stopped in a store that sold chocolate. The nicest lady worked there and offered lots of samples, so obviously we all bought (the least expensive) chocolate there. We'd decided to skip dinner, so we retired to our room early and went to sleep. We'd had a busy day and one full of excitement. Our schedule allowed for only one night, but two days in Zurich, so we had a much more pleasant second day. Recap of that up next!